So far the weather is holding and I have some tomatoes left. This is a quick and delicious way to use them up. Use fresh herbs, minced, if you still have them in the garden. Preheat broiler. Place tomato halves, cut-side-up, in shallow baking pan. 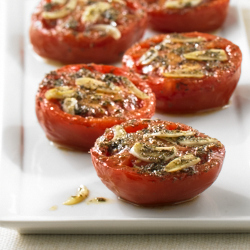 Sprinkle tomatoes with garlic, Italian seasoning, salt and pepper. Top tomatoes evenly with butter. Broil tomatoes, 4 inches from heat, 10 minutes or until tomatoes are warm, being careful not to brown garlic. Spoon pan juices over tomatoes before serving.